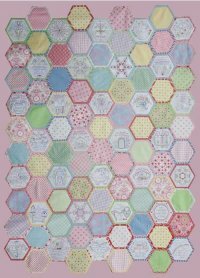 This quilt-as-you-go hexagon quilt truly speaks to best friends. Best Friends Forever (B.F.F.B.O.M.) is a 12 month block of the month program that finishes 52"x72." The adorable embroidered hexies come with the pattern already transferred to the fabric. Only $24.99 a month. A collection of 37 paper-pieced projects featuring some of the best work from today's most talented modern quilters. You can learn everything you need to know about foundation paper piecing. It includes instructions for sewing the patchwork by hand with traditional methods. It can also be stitched by machine. This is a great way to English Paper Piece using the elongated hexagon. Applique With Deirdre of the Quilted Crow Girls at HIQ! Deirdre Bond-Abel of the Quilted Crow Girls, our friends from Tasmania, Australia, has designed a wall-hanging especially for Happiness Is ... Quilting! named Mrs. McKinney's Parlour! 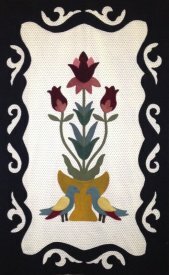 Join Deirdre in one of her four upcoming workshops to learn the Quilted Crow Girls' unique approach to hand applique of wool onto cotton. This is going to be such a fun time! Saturday, May 3, from 10 a.m. - 1 p.m.
Saturday, May 3, from 2 p.m. - 5 p.m.
Sunday, May 4, from 10 a.m. - 1 p.m.
Sunday, May 4, from 2 p.m. - 5 p.m. Need to de-stash so you can re-stash? Need to reenergize your projects? Join us for the Alley Sale - the Quilter's Ultimate Garage Sale! All the fun will take place Saturday, April 12, from 10 a.m. - 4 p.m. 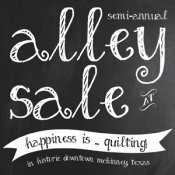 This year the Alley Sale coincides with McKinney's Art Walk, which will increase shopping traffic to your booths. Also, the location of the sale has moved to Kentucky Street just in front of the shop due to the construction. Jack Gresham of Mobile Knife Sharpening will be there to sharpen your scissors and blades from 10 a.m. - 12:30 p.m. Spots are filling quickly! Reserve your spot today for $10 and shoppers mark your calendars to not miss out on these great deals. Join M.J. Fielek once a month for Tips and Techniques with an Expert. Each month this award winning quilter will share a valuable tool or technique to produce beautiful quilts that you are proud to show. She will cover all aspects of quilting. Thursday's session is April 3 from 6 p.m. - 8 p.m. and Monday's session is April 14 from 12 p.m. - 2 p.m. Spots are filling up fast. Do you love all those beautiful stitches you see on the wool work? Join Jill Green in her two-part class beginning Friday, April 4, from 10 a.m. - 1p.m were she will take you step-by-step through a multitude of stitches from Sue Spargo's Creative Stitching book including couching and beading techniques. Register Here. Do you have a lot of unfinished quilts that just need the bindings done? Join M.J. Fielek on Saturday, April 5, from 10 a.m. 1 p.m. to learn how to put the finishing touch on your quilt...the binding! This class will teach you how to bind a quilt. It will cover straight, bias, 2-color binding and much more. Enroll today.